Something happened in late January in South Philadelphia that went almost unnoticed. Over a hundred residents and hundred staff of the Cambridge Retirement Community Homes on the corner of Broad and Snyder were given the thirty-day notice required by law to get out. According to newspaper and television sources, increasingly stringent state regulations requiring more staff and more fire escapes, causing the facility to run at a loss, were to blame. A parachaplain and nine-year volunteer at Cambridge House, I learned it from one of the residents on one of my twice-monthly visits. The residents, a half-dozen or so of whom are Jewish, used to disappointment, are trying to cope. These are people who are not sick enough for a nursing home and too poor for an expensive private assisted living facility. The younger individuals often have a degree of developmental delay or psychiatric illness; the old people seem mainly destitute. They wind up in these little for-profit facilities that provide them with some assistance in activities of daily living, medication supervision, and three meals in exchange for most of their SSI check. When I first started visiting in the late 1990s, there was a larger Jewish population. We would have a pretty lively Thursday night Kiddush. I did my best to ignore the younger resident who held nightly Christian fellowships and was always trying to convert the Jewish residents, who would attend any prayer service to alleviate their loneliness and boredom. I tried to make jokes about the mice that frolicked all around the cafeteria in plain sight (they were later eradicated). Lately the Jewish population at Cambridge House has decreased, which is a good thing. Jewish Family and Children's Service, whose Boarding Home program has been subsumed into a larger parachaplaincy program due to cuts in Federation funding, can only help so much. There are no beds set aside for the Jewish poor. I keep in close contact with my clients at Cambridge House. The results so far: my "girlfriend," a developmentally delayed woman who loves teddy bears and who always reminds me when it is time to spring forward/fall back, was placed with a coworker from her sheltered workshop. It took me days to find out that the placement hadn't been made willy-nilly (I had visions of her being chained in the basement while everybody drank up her SSI check) but was being handled by Catholic Social Services. Several people from the Mental Health Association of Southeastern Pennsylvania were working on similar placements for the other Jewish clients; one resident had turned down two other boarding home residences (Cambridge House is the Ritz Carlton compared to some of the other places) but accepted a third. He calls me every few days; his psychiatric problems are being exacerbated, and he has already been hospitalized once. Another man has called me several times, saying he really doesn't like his placement, that there are fewer places to walk to in the area, but he has to wait until a caseworker can help him at the end of the month. As of March 5, the Philidelphia Inquirer * reported seventeen people still awaiting placement, and some residents being placed as far away as Reading and Erie because of the shortage of beds. We volunteers learn in our parachaplaincy training to remind our clients that everyone is made in God's image, and that mitzvot are important work whether performed in a beautifully appointed home or in a mouse-infested basement cafeteria. Seeing what befalls these people makes it harder and harder for me to convey that message. 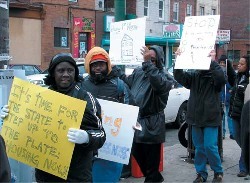 Local Philadelphia charities and the state have let the most vulnerable citizens down.